Total Bull is a hard-working fellow from the big Cow City. But for all his hard work (a wife, a mortgage, a car) he feels like something is just missing from his life. So he decides to go on a journey of discovery. 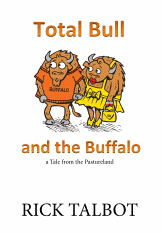 Along the way he meets the mythical and mysterious Buffalo civilization. By Rick Talbot. August 15, 2002. The last decade of the 20th century - and the beginning of the 21st century – has seen a drastic shift away from post-modern thought and values. The predominant social themes of the recent years have moved away from post-modern ideals. The human mind has collectively evolved beyond the questioning of meaning, has decided that there is none, and has resigned itself to self-destructive outlets. In this new era, which we should call post-meaning, we find the ultimate expression of the “Me Generation.” Namely, the self is important; others are irrelevant. Cultural relativism has given way to global homogeneity, and has headed toward non-culture. Ethnic diversity is being lost around the world. Finally, the question of God’s existence has become irrelevant, as God himself has become irrelevant and, by consequence, meaningless. I thought of the idea of the post-meaning era as I was walking through the park one day in April. I then searched the internet for the term “post-meaning” and found that the first usage comes from a 1994 article, “The Meaning of Meaning in a Post-Meaning Age.” And so, though I have not been the first to think of it, I hope that I can offer meaningful speculation on this new frame of reference. This article will reflect on the dawn of the Post-Meaning era.